NRA mulls integrated settlement in Kathmandu Valley - Integration Through Media ....! Kathmandu, Feb 7 (RSS): The National Reconstruction Authority (NRA) has floated a proposal to develop an integrated settlement with multi-ownership in the dense area of the Kathmandu Valley. 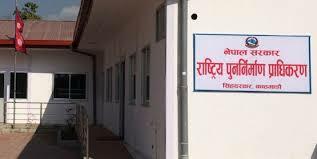 The meeting of the NRA held Wednesday with the representatives of Kathmandu and Lalitpur Metropolises decided for raising the dwellings based on house pooling system, reasoning that no houses damaged by the earthquake in the Kathmandu Valley were reconstructed till now. The Kathmandu Valley witnessed the damages of more than 100,000 houses during the 2015 quake. Only 20 percent of such houses have been reconstructed so far. Such is the case of houses built in small area. NRA Chief Executive Officer Yuvraj Bhushal informed that the meeting attended by the Mayors of Kathmandu and Lalitpur Metropolis decided to develop integrated dwelling based on house pooling.”The meeting also formed a 5-member taskforce under the coordination of Joint Secretary at NRA, Raju Man Pradhan. It is assigned to conduct a study now the integrated settlement could be developed in the dense Kathmandu Valley, and submit a report within 15 days,” he added. Former Director General at Department of Urban Development and Building Construction, Surya Bhakta Sangachhe, has been picked for assisting the study taskforce. During the meeting, Sangachhe had also presented a working paper how the integrated settlement could be raised.